New in paperback: Millennial blogger recounts her yearlong shopping ban in a memoir that inspires readers to radically simplify their own lives and redefine what it means to have, and be, "enough." Now available for the first time in paperback, The Year of Less documents Cait's life for twelve months during which she bought only consumables: groceries, toiletries, gas for her car. Along the way, she challenged herself to consume less of many other things besides shopping. She decluttered her apartment and got rid of 70 percent of her belongings; learned how to fix things rather than throw them away; researched the zero waste movement; and completed a television ban. At every stage, she learned that the less she consumed, the more fulfilled she felt. Cait Flanders is a former binge consumer turned mindful consumer of everything. Through personal stories, she writes about what happens when money, minimalism, and mindfulness cross paths. Cait's story has been shared on Oprah.com, Forbes, Yahoo!, The Guardian, The Globe and Mail, CBC News, and more. She inspires people to consume less and live more, on her blog, caitflanders.com. Cait lives in Squamish, BC, Canada, with her three loves: the mountains, the forest, and the ocean. "If you’ve ever felt there must be more to life than consumerism and its vicious cycle, you’ll find inspiration to break free in The Year of Less. Cait’s highly readable and personal story is encouraging, challenging, and unbelievably helpful." "Cait Flanders is a brave woman. As I read, I cried. But my heart also brimmed with joy. For anyone who doesn’t think they can, Cait’s story shows that it doesn’t matter where you start, only where you go from there." "Cait’s audacious goal—a yearlong shopping ban—has sparked a deeply personal book full of lessons for all of us on finding more fulfillment and meaning in our lives (without all the stuff!). A game-changing read for anyone searching for simplicity in our consumer-focused world." "The Year of Less is beautiful, vulnerable, and real. Cait’s words inspired me to be braver in my writing and life, and I’m sure it will inspire you too." "Minimizing belongings in my life cleared space for so much goodness to fill the space stuff once did. Cait’s The Year of Less is inspiring . . . a powerful example of how transformative downsizing possessions can be, and how you can take it to the next level." "Cait comforted herself with alcohol, binge eating, and compulsive shopping, then finally said, ‘Enough is enough.’ This isn’t another book about how to live with less, but instead a heartbreaking and then a heartwarming story that shows us if we are willing to let go of the things we think we need, we can have a life we really want." "Creating meaningful change in your life takes significant time and effort, and in this book Cait shares a deeply intimate view into just how substantial that change can be. 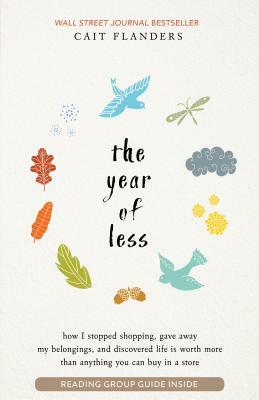 If you’re looking for inspiration and practical examples of how to take steps toward a better future for yourself and the people you love, The Year of Less will give you that and so much more." "This book is such a gift. A gift for anyone who’s ever wanted to change but has been afraid—afraid to fail, afraid of what we might discover about ourselves as we strip back the layers, and afraid of what will happen if we don’t. Cait writes beautifully and honestly about the work of creating a life with less, and gives you permission to step off the ever-revolving carousel of compulsive and mindless consumption and into the goodness that lies on the other side." "An inspiring story of how one woman overcame the obstacles of addiction—to shopping, alcohol, and food—to create a purpose-driven life. You will walk away ready to change your life and with an understanding of why embracing less will set you free."